EK Kenya Director makes first trip to the U.S! Posted April 19th, 2017 by Kelsi Hines & filed under Uncategorized. 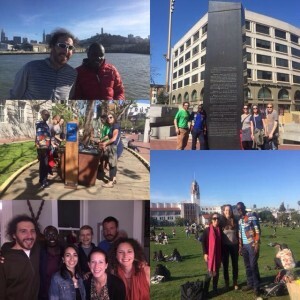 OHR Co-founder and Kenya Director, Richard Magerenge, makes first trip to the U.S.! We were more than thrilled to finally share our community with Richard! After eight years of dedicated cross-continental collaboration, Richard Magerenge, co-founder and executive director of Organic Health’s Response’s Ekialo Kiona Center on Mfangano Island, made a highly-anticipated inaugural visit to the United States – and his first trip outside of Africa! From March 15 to April 7, Richard embarked on an ambitious three-week tour of Minnesota, California and Colorado, where he had an opportunity to meet with several of OHR’s friends, board members, funders, partners, and potential collaborators. Richard began his trip in Minneapolis, where he was unsurprisingly welcomed by cold weather, but he learned fast – and bundled up quickly! Together with Kelsi Hines, executive director, and Chas Salmen, fellow co-founder and board president, Richard gave a presentation to the Minnesota International Nonprofit Network. He also helped finalized an exciting new academic partnership with the University of Minnesota’s Center for Global Health and Responsibility and Department of Family of Medicine, where Chas will be joining the faculty later this year. Before departing, Richard also partook in local St. Patrick’s Day festivities and experienced the Midwest-Scandinavian tradition of sauna! OHR Board Retreat in San Francisco! Richard then made his way westward to San Francisco. 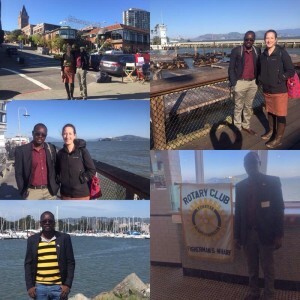 As a founding board member of the Rotary Club of Mbita-Mfangano, Richard had the opportunity to mingle with fellow Rotarians at Clubs in San Francisco, Oakland and Berkeley. Longtime partners at Microclinics International and Craig Newmark of the Craigslist Charitable Fund also met with Richard after several years of working together from afar We also reconnected with our academic roots at the University of California – San Francisco, where Richard spoke to graduate students in the Masters of Global Health Science Program. After a busy week of meetings, we also made sure to schedule in some time for some much needed r & r after a board retreat! Richard thoroughly enjoyed hearing live chamber music for the first time at a concert in the home of our board member, Lily Muldoon. We then concluded this leg of the trip with a scenic boat tour of the San Francisco Bay, captained by co-founder and board member, Adam Sewall. Before returning to Kenya, Richard head to Colorado, where he met up with Bicycles for Humanity, an organization that sources our bike shop on Mfangano Island, and the leaders of Rotary Clubs in Denver, Centennial and Fort Collins who have supported us over the past eight years. With the help of the greater Rotary of Colorado, OHR has been able to build the Ekialo Kiona “EK” Center and the EK demonstration farm, and purchase the engine to the first ambulance boat for the region. Richard and his staff have graciously hosted countless researchers, students and volunteers from abroad over the years, and we were thrilled to finally return the favor! It was surreal to see Richard on American soil – and look forward to seeing him stateside again.